The splendor of Pasadena’s golden era awaits you, as the Castle celebrates the holidays! Take a step back in time at the historic Castle Green, a blend of Moroccan and Victorian architecture, built in 1898 as part of the resort Hotel Green. Now privately owned apartments, and generally closed to public, the building will open its gates and welcome visitors, for the annual Holiday Tour on Sunday, December 5th. Once converted to private residences in the 1920’s, Castle Green attracted many designers, musicians, artists and collectors to live in the building. 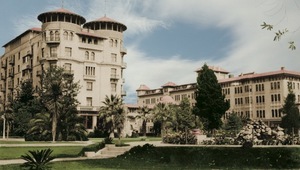 Those who find an interest in history, creative interior design, and cultural heritage, will see the original exterior and interior of this unique city landmark, the last remaining survivor of the hotel period in Pasadena. While trained docents will be available, you may walk at your own pace through the original public rooms and over 20 individual apartments, all differently interpreted for the holidays. See the Grand Salon, the Moorish and Turkish Rooms, the Palm Room, Sunroom and Veranda, the open cage elevator, fireplaces, hand-carved woodwork, and marble staircases, the bridge and penthouse, with a 360 view overlooking Pasadena, as well as artist studios. A 14-foot Scotch pine and holiday music will welcome visitors entering the Grand Salon. Exhibits and signage will describe particular rooms and features, some with movie stills from as far back as 1918. Exhibition ballroom dancing by costumed Victorian-Era throwbacks, also for display and sale, turn-of-the-century style, hand-blown ornaments and glassware by artisan Evan Chambers. Guests will enjoy sweets and cider, and food samplings from local caterers. The semi-annual tours of the Castle Green are organized by volunteer members of the nonprofit support arm, Friends of the Castle Green, whose mission is to provide and implement restoration to the building. All funds raised through the tours and merchandise sales are dedicated to the preservation of this landmark building. Cost: $20.00* adults, children under 12 are free.